For the ones working in the hiring and staffing business, piling workloads and the pace of profession is nothing new to them. Most important of all, recruiting isn’t some random skill that you can master overnight and set your profession on autopilot mode to get things done. This is why an increasing number of talent acquisition experts and HR professionals are resorting to HR software and systems to simplify recruitment. We all know how social media has transformed the process of recruiting for businesses across the globe be it a startup or a big scale organization, social media is certainly the way-to-go for all when it comes to recruitment these days. Nevertheless, after social media, the next big thing in the world of recruitment according to tech pundits is big data. Yes, big data is slowly but successfully catching up a lot of traction in the recruitment ecosystem. But before we delve into its implications in the hiring landscape, let us first understand what big data exactly is. For the amateurs, big data is mainly about amassing and analyzing huge volumes of data gathered or sourced from a plethora of different sources. Often, big data is a disparate chunk of information. Big data helps you study and identify preferences/interests of existing as well as future employees by amassing and analyzing their social media data such as their Twitter and Facebook interactions and history, that is big data for you. For instance, you can learn about a person’s penchant for a particular sport or sports team or dislike toward certain trend. Big data helps HR professionals and talent acquisition experts to rollout strategic and analytical recruiting campaigns. Most important of all, it eliminates grotesque nightmare of wrong hires. Yes, big data eradicates the old-school practice of relying on your gut feeling to recruit a particular candidate. Big data offers you with intelligent insights and data pertaining a candidate’s previous employment history, social media interactions/behaviors, etc. This should help in knowing the candidate in a much better way. The huge chunks of information gathered through various sources should assist HR professionals and talent acquisition experts in screening as well as in shortlisting the best candidates from the lot minus the clutter. The most prominent benefit of big data for hiring is that it helps to curb employee attrition rates thereby, relieving hiring experts and HR, as they won’t have to go through frequent hiring spree. Big data on the other hand can be a great tool to unravel underlying reasons or factors that are causing high attrition rates for your company. Further, having a good HR software here can assist you in analyzing tons of employee data gathered from employee surveys/feedbacks, exit interviews, etc. This would help you unearth underlying or hidden reasons that are making employees to quit the organization. For instance, big data analysis may help you unearth a specific pattern that would further help you redo the entire recruiting strategy and to keep attrition rates in check. We all know the importance of job portals when it comes to sourcing information on potential employees. Big data can be a boon here, since analysis of such data will offer predictive analytics from these famous job portals for recruiters. For instance, a recruiter can learn about the suitable time of the week or day in a particular month to post or publish about a job post on a particular job portal. Moreover, big data can help to unravel valuable trends and patterns to why candidates are applying or ignoring a particular job posting. This would help you tweak or redo your recruitment approach to attract more and more candidates. Simply put, big data is nothing but connecting all those dots. Big data does the quintessential and much-needed task of eradicating the ‘guesswork’ from a recruiter’s life for good. Armed with insightful and predictive analytics, recruiters get to learn about candidates, which in turn helps to optimize their hiring strategy. 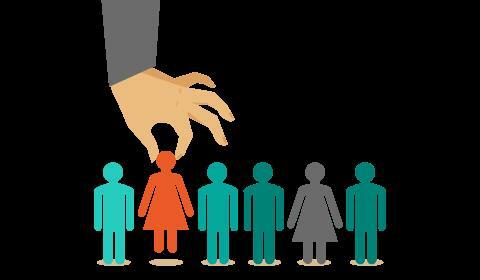 Big data escorts a recruiter from gut feeling approach to a more data-driven hiring decisions. The post is by Anwar Shaikh, who writes about human resources, cloud technology, chatbots, and all things technology.